← Damn the Torpedoes! Full Speed Ahead, Washington Dentists! As our profession has evolved from amalgam to composite for posterior direct restorations, one of the biggest clinical challenges has been creating consistently good proximal contacts. A number of gizmos have come through the marketplace promising to solve this vexing issue. I’ve tried a number of them with varying results. But, the one device that has helped a lot is a sectional matrix system that incorporates a “G-ring” or a ring with tines that engage the facial and lingual embrasures creating a separating or wedging force. One issue with the G-rings is using them in combination with a wedge (to seal the matrix against the gingival margin of the proximal box). The G-ring tines would interfere with the wedge, or it would be the other way around. Basically, they were reluctant partners in the system. The evolution of "g-rings" in my practice. 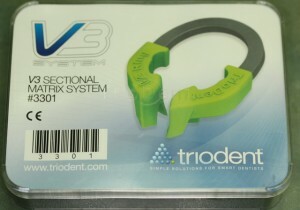 The V3 ring system, by Triodent, is an ingenious modification of this device. Instead of a single tine to create the wedging force, they split it into a “V” creating space for a wedge right through the middle. But, the folks at Triodent didn’t stop there. They created a sectional matrix that is anatomically contoured. 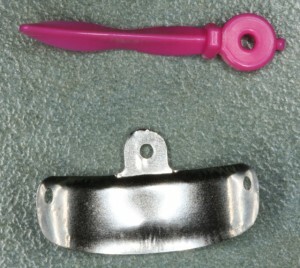 In the kit, you’ll find three sizes: premolar, molar, and molar with a gingival extension. The matrix also has 3 little holes strategically located to make removing the band easy. And, you’ll need that help, because the contact WILL be tight! Of course, the system comes with a special pair of pliers that engage those little holes. And, you’ll love that resistance you feel when removing the sectional matrix band, as it will confirm you have created a great contact. Not only will the contact be tight. It will be a broad contact, rather than a point-contact that is often created by traditional matrix bands. They also include a special “waved” (anatomically contoured) wedge that also has a little hole for the special pliers, making it easy to place and remove. Below is a sequence of photos of a recent case I did. In case you’re wondering, isolation was done with the Isolite system. From left to right: 1. Pre-op. 2. Old restoration removed and decay exposed. 3. V-ring in place. 4. Composite placed. 5. Restored (needs a bit of recontouring at the line angles). Nice broad contact! Another view of the V-ring in place. You can also see the Isolite system in the background. The Triodent V-ring system comes with ring forceps and wedge / matrix pliers that work very well. 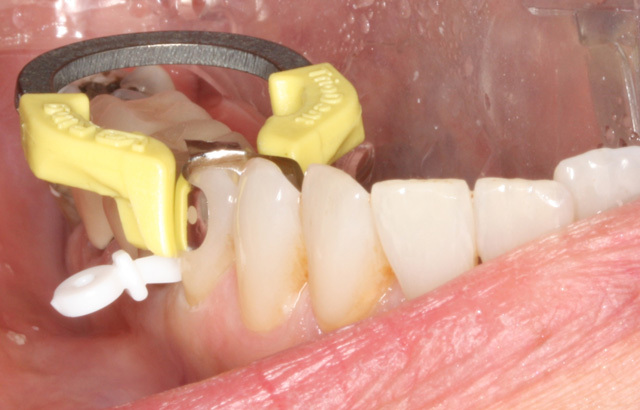 The V3 ring system from Triodent makes Class 2 posterior composites easy, predictable, and stress-free. And, it fits right into the Dental Warrior creed of a small investment with great returns. Triodent has a “V3 starter pack” for $499 that includes everything you need. Give it a shot, if you haven’t already. It’s so good, I feel quite certain you’ll be very happy with the results you get. This entry was posted in Clinical Technique, Dental Product Reviews, Tips & Tricks and tagged class 2 composites, posterior composites, Triodent, v-ring, v-rings, v3 ring. Bookmark the permalink. I agree – I have been a fan for many years of the sectional matrix system by Garrison – either way, unbeatable contacts in the least amount of time = TIMEfactors! I will give a kit to any Doc and ask them if they will send it back a week later….never happens. I’ve been using bitine rings danville matrixes for years with inconsistent results. I personally just picked up this system at the recent CDA and its just amazing. At first, I was turned off by the costs of all the components, but to get perfect contacts is worth it and I have zero regrets. Nothing more frustrating than a less than ideal proximal contact. I’ve tried just about all of the systems. And, while I often got decent results, it wasn’t always. With the V-rings, I’m finding I get excellent, broad, tight contacts every single time. Well worth the initial expense. Please send aditional info on the ” V- RING'” to e-mail address or thru the regular mail. Thnk you, Craig Miller Buccialia, D.M.D. I don’t work for Triodent. I’m just an in-the-trenches dentist. You can find their contact info at http://www.triodent.com. Thank you for this wonderful review of several of the Triodent products. Ultradent is very excited to be able to start selling them April 1, 2012. We agree that they are a high quality product and easy to use. I am glad they are working out well for you. We look forward to being able to include them in our prouct line. Again, thank you!